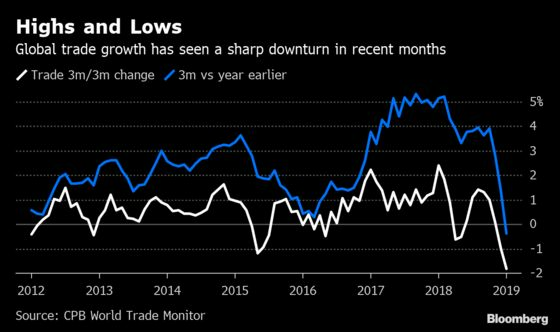 (Bloomberg) -- Global trade has taken a sharp turn down, reinforcing the view that the world economy is in its worst state since since the financial crisis a decade ago. The January World Trade Monitor by the Dutch statistics office includes an assumption of zero percent import/export volume growth for the U.S. as the shutdown means it doesn’t have data. On a month-on-month basis, global trade volumes were up 2.3 percent, though the figure is erratic and it fell almost 4 percent over November and December. The underlying figures tally with a global growth tracker by Bloomberg Economics, which also shows a dramatic loss of speed. The index puts world growth at 2.1 percent on a quarter-on-quarter annualized basis, down from about 4 percent in the middle of last year. Chicago Federal Reserve President Charles Evans said Monday that right now the “risks from the downside scenarios loom larger than those from the upside ones.” The pessimistic view was echoed by IMF First Deputy Managing Director David Lipton, who said there are “growing risks and uncertainties,” including protectionism and U.S.-China trade tensions.